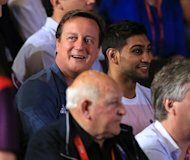 The "massive self-confidence boost" given to the UK by the Olympics could help drag the country out of economic trouble, David Cameron has suggested. Opinion polls at the close of the London Games demonstrate a significant public pride both in the country's team and its ability to host a successful global event. With the end of the sporting extravaganza, voters' attention is bound to refocus however on what the Prime Minister conceded remained a "very tough economic situation". Shock GDP figures released just days before the Games began showed a worse-than-expected 0.7% decline between April and June putting the UK in the longest double-dip recession probably since the Second World War. And while Team GB was finding sporting success, there was more bad news for the economy, with the trade deficit widening to a record level and the Bank of England predicting flat output for this year. But Mr Cameron said the success of the Games showed the UK could "turn things around". "It is an enormous confidence-booster about who we are as a country, what we can do, what we stand for, and the fact that we can make our way in a very tough and competitive world," he told BBC News. "We do face a very tough economic situation and I do not belittle that at all. It is a very tough economic world that we are in. "But in a way what these Games show is that if you work hard enough at something, if you plan something, if you are passionate enough about something, you can turn things around. "I think that is the lesson people can take from these Games."